Clear and clarify the look of skin with the Garnier Pure Active Charcoal Anti-Blackhead Nose Strips; innovative patches that work in just 10 minutes. Infused with Charcoal, the strips target blackheads and draw out pore-clogging impurities to reveal a clean, fresh complexion without pinching and squeezing. Ideal for decongesting oily T-zones, simply place the patches on the chin, nose or forehead to fight blackheads and shine. Wash your face thoroughly and pat dry. Apply the strip evenly to your nose, chin or forehead. Wait 10-15 minutes then gently peel off. Use up to 2 times a week to fight the appearance of blackheads and shine. 967381, PVP, VP / VA Copolymer, Alcohol Denat., Aqua / Water, CI 77499 / Iron Oxides, Dimethicone, Charcoal Powder, (F.I.L B215404/1). 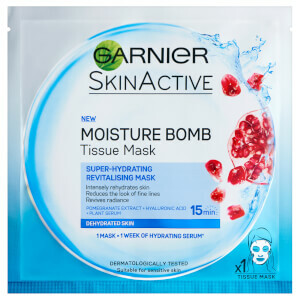 Receive a FREE Garnier Moisture Bomb Pomegranate Hydrating Face Sheet Mask when you spend S$30. Complimentary gift will be awarded at the basket. Offer valid for a limited time only, while stocks last.